Voice your opinion! Review Destin Towing now. I wanted to chalk many of these bad reviews up to sour grapes, but after just having my own terribly unprofessional experience with Destin Towing I'm convinced the owner is either a crook or the world's worst businessman. He had to tow 3 of my customers' cars - not because they were illegally parked but because they were on a 2day fishing trip and the property owner was setting up for the Seafood Festival in the parking lot and their vehicles were unfortunately in the way at 830am. I was contacted by the property manager and understood the situation. I called the listed number and spoke with Scott who started to defensively explain the situation. I told him I understood and that I just needed to know where the lot was, how much this was going to cost and what time they closed. He responded with "on Mountain Drive, $125/vehicle and 4pm." My only problem was the 4pm answer and I was audibly upset when I informed him that the boat wouldn't be in till 6pm. His response was, "well that's your problem." I told him this was going to be really bad and I had to call the property owner back and hung up. Let me reiterate nobody was parked illegally, the property owner and the festival coordinator did not want them towed to the impound lot.....just out of the way. I immediately called the property owner and informed her of the situation at which she was also very upset and concerned. While on the phone with her, Steve called me back and begrudgingly told me he'd have someone stay till 7pm but not a minute longer. I thanked him and promised him we'd get the customers there before then. I called the property owner back and told her what he'd said. To this point all parties involved had been stressed but polite to each other and understanding....except for Steve. He could have cared less, was short and rude on the phone, and acted like he was doing me a big favor staying open 3hrs. Fast forward to 630pm when I show up with my 3 customers who are understandably upset but are not being belligerent. The lady behind the counter was ready for us with the paperwork. She informed us that will be $150.....I immediately balked and said I was quoted $125! She said well the cars have been here more than 8hrs, there's a storage fee. I said that's not what I was told. She said to take it up with the owner. I asked to see him and she told me I'd have to call him. While I was on the phone my fed up customers tried to just pay her but ran into the next scam. We knew it was cash only thanks to some homework on my part, not because Scott thought to tell me. But she claimed she couldn't provide change for $100! I asked if I could pay with a company check and she said cash only. Thankfully we managed to scrape together change between the 4 of us. While we were waiting for the vehicles Scott calls me back and I upsettedly start complaining that he quoted me "$125 not 150 and then to add insult to injury can't make change for $100 at a cash only business!" Now I'll admit I was audibly upset but I hadn't cussed or been inappropriate to this point. "His response was, "I never said any such thing. There's $300 in change there. And this entire conversation is being recorded....." At that point I got really angry. Instead of taking an opportunity to make some good community neighbors (that I'm gathering from the reviews, posts, news articles and general bad press, he could have used), making a bad situation right, and following the law.....he accused me of lying and threatened me with what I can only imagine is legal action by telling me he was recording our conversation. Let me again state, I understood the situation, approved the towing and was prepared to pay the $125/vehicle. I wasn't at all upset at about any of that. It was an unfortunate situation I was trying to make the best of. What I wasn't going to take was rudeness, being overcharged and then being mistreated. Unfortunately for him I do my homework. I know he was going to violate state regulations by closing at 4pm and implying my customers were SOL after that AND I have witnesses to prove it. I have gotten legal advice and will be contacting Destin and State of Florida governing authorities in the am with a report. I will share how anyone else can do the same when I have that info. I came to relax with my family on June 1, 2017, and to enjoy Thursday fireworks. For 3 summers now, my family would leave our car on a tiny parking space across the AJs. We were gone somewhere between 8.30pm-9.30pm and came back only to discover that the car was gone! There was a group of other people, tourists, just like us, who were unpleasantly surprised to find their cars vanished. It turned out towed away by Scott Leach and Destin Towing, who made folks to pay $125 to get their cars back. Only cash was accepted, no receipts from a cash register were provided in return. Scott Leach, the owner, claimed that there were 8 signs all located in the parking plaza, but I know there is a single one. I understand these signs should be prominently located, but this single sign was located on the businesses side, so it is very confusing for tourists, especially when they (like my family) have been parking for 3 summers in the same parking space. Destin Towing owner, Scott Leach, also lied to me that "You were lucky before as I have been working from the same place for 3 years". No, you did not, the info on your company states that you started in this place August 31, 2016. Folks, do not park your vehicles across the AJs in Destin. There are hawks like Scott Leach who make money fast off the unsuspecting tourists! How can the city of Destin put up with "businesses" like that one? Scott Leach and Destin Towing are busy towing cars away after business hours from the shopping square across the AJs in Destin, FL, and taking advantage from people mostly on their vacation. The thing is, the tow-away zone sign, according to the law, should be posted prominently and unambiguously, not just facing businesses as the single sign currently does. The Destin Towing owner should also be more knowledgeable and truthful and not lie to his "customers" who came back only to discover that their vehicle was taken away from the parking space and are trying to find their vehicle. He also involves his entire family into his "sustainable" business, there were young kids in the room serving as his office as late as 10pm on June 1, 2017, Thursday. The whole thing felt like and smelt like a suspicious racket, you want to somehow make back home, pay up $125. Scott Leach, do not dare to write back to this review and say how sorry you are. Because you are not. I am ashamed and embarrassed the way the city of Destin, FL, allows these things to happen. What Scott Leach writes under an earlier comment giving him and his company as "Do you think we actually enjoy getting up from dinner with our family, or leaving a ballgame with our children to come and remove vehicles for people that can not comply with the rules?" is a lie, I observed very young kids in the small room as late as 10pm on June 1, 2017 (The International Children's Day everywhere but obviously not in his family). I agree, I saw a single inconspicuously located tow-away sign. Scott Leach and Destin Towing is not "getting up from dinner with our family, or leaving a ballgame with our children to come and remove vehicles", as his young kids can be found in the office as late as 10pm. Shame? Folks, yet another lie by Scott Leach: have a look on the right hand-sided panel, it says the company accepts credit cards. They do not. They make you pay in hard CASH! No credit cards. 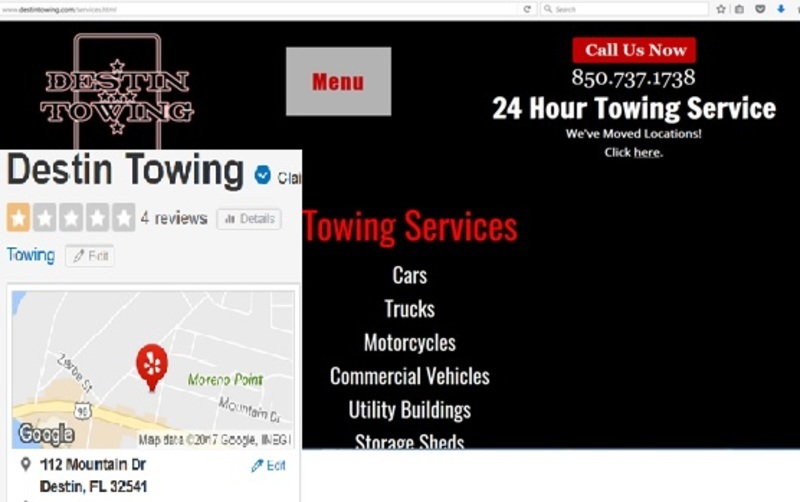 Is Destin Towing your company? 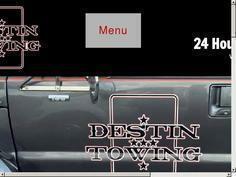 Destin Towing 24 hour towing service. We serve the lower 48 states!